Dr. Dan Kuykendall graduated from Auburn University College of Veterinary Medicine in June 1996. Upon graduation he first practiced with Dr. Grady Lanier in Ocala, Fl. In 1997, he moved to Birmingham to work with Hoke Animal Clinic and Green Springs Animal Clinic. He was raised in Opelika and returned to the area in 1999 after purchasing Village Veterinary Clinic from its founder. He and his wife, Meredith, have two daughters, Emory and Elizabeth. His four-legged companions are Molly and Coach (dogs) and Lola (cat). He enjoys golfing and woodworking and his professional interests include surgery and dermatology. Dr. Chip Kuykendall graduated from Auburn University College of Veterinary Medicine in June 1994. Upon graduation he practiced with Drs. Marcus Martin, David Kuykendall and Tom Dawkins in Birmingham, AL. In 1996, he and his wife Joan moved to Clearwater, FL where they purchased Court Street Animal Hospital. They owned the practice until June of 2015 when they sold it and moved back to Auburn. They have three children, Ana, Aaron and David as well as Megan their Shetland Sheepdog. His hobbies include following Auburn football, soccer and reading. Liz Hickman Kuykendall was born and raised in Pigeon Creek, a small community in Butler County Alabama. She graduated from Greenville High School in 1960 and from Auburn University in 1963. She was married to Dan Kuykendall Sr. for 43 years. Dan and Liz moved to Opelika, Alabama in 1970 with their two children, Kathy and Dan II, who is Village Veterinary Clinic's own Dr. K.
Liz has four grandchildren, Maggie, Jackson, Emory and Elizabeth, and three great grandchildren, Nathan, Cade, and Harper who are the loves of her life. 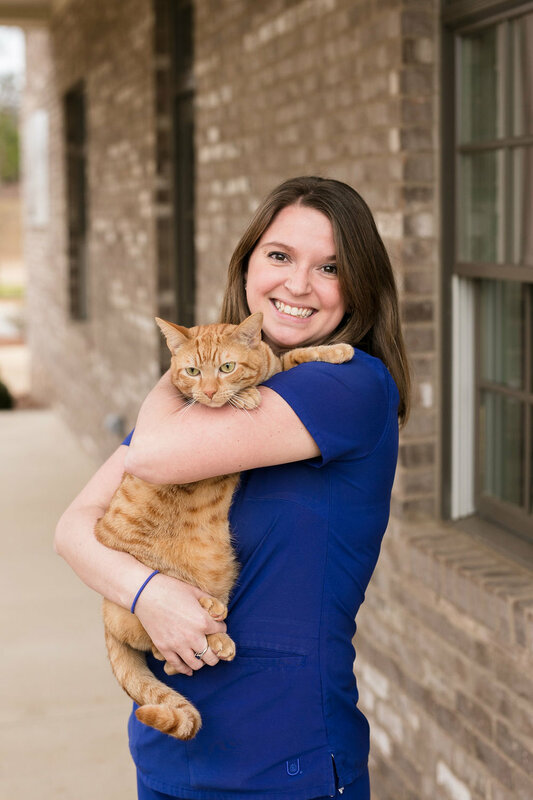 Liz joined the staff of Village Veterinary Clinic as office manager in July of 2006. In her free time, Liz plays golf, bridge and loves Auburn Basketball. Teigha (pronounced TEE- UH) graduated from Benjamin Russell High School in 2005. She received a degree in PreVet Animal Sciences from Auburn University in 2011. She completed her LVT(Licensed Veterinary Technician) degree from Jefferson State Community College in 2013. She worked at Alexander City Veterinary Clinic since 2007. Teigha moved to Lanett and began working here at VVC in January of 2016. She is married to Matt and they have a daughter and son, Cheyenne and Briggs, and three dogs (Lily, Rosemary and Copper) and four cats (Pemchoke, Scratchy, Ava and Stormy). Her hobbies include spending time with family, cooking and the outdoors. Victoria graduated from Auburn High School in 2011. She recently graduated from Auburn University with Dental Assisting certificate. She has two dogs with Austin, Big Jack, who is a black lab, and Little Jack, a Jack Russell Terrier. Victoria loves spending time with them, traveling, and all sports, especially Auburn sports! Riley graduated from Theodore HS in 2010. He worked at Theodore Veterinary hospital for 4 years before moving to Auburn in 2015. He started working at Village Veterinary Clinic in August 2015. His hobbies include gaming, fishing and hunting. Taylor graduated from Bishop Fenwick High School in 2014. She received a degree in Medical Laboratory Science from Auburn University in 2018. She started working at Village Veterinary Clinic in 2017. Her hobbies are reading and cooking. She owns a French bulldog named Toby. Lina graduated from GW Community School in 2004. She attended Northern Virginia Community College. She began working here at VVC in early 2016. She has years of experience in a dog kennel facility along with professional dog trainers. Her hobbies include reading, video games and training her dogs in her spare time. She has two dogs Cassandra and Isabella. John Henry graduated from Oak Mountain High School in 2017. He is currently attending Southern Union with plans to become a veterinarian. His hobbies include kayaking and hanging out with friends. Emma is currently a junior at Auburn University studying Biology with a focus in Pre-Veterinary Medicine and a minor in Animal Science. She plans on applying to Veterinary school at Auburn this fall and studying to become a DVM in large exotics. When not working, she enjoys camping, climbing, and being on the water. Sarah from Quincy, Florida and graduated from Maclay School in Tallahassee, FL in 2017. She moved to Auburn in August of 2018 and started attending Southern Union State Community College. Sarah has plans on becoming an elementary school teacher. She has a beagle named Beau. She loves to be outdoors, hang out with friends, and enjoys cooking. .
Rebekah is studying Microbiology at Auburn University. She hopes to become a Veterinarian. Her hobbies include going to the gym and playing with her cat, Socks! JT joined us late in the summer of 2018. He was previously a stray kitten that we were lucky enough to add as a member of the VVC family. He is quite fond of chasing things, playing with toys and loves to cuddle. Be sure and ask to say hello to him when you are here.